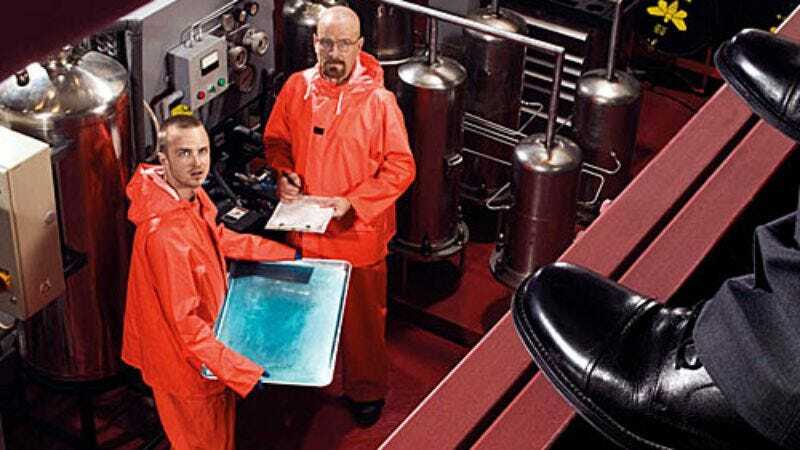 While the official, above-board merchandising for Breaking Bad has thus far been limited to DVD sets and soundtracks, fittingly the show has also produced a booming black market. In addition to the meth-making show inspiring Hot Topic T-shirts and, quite possibly, the actual making of meth, Breaking Bad has also spawned the apparently booming business of "meth candy" in Albuquerque, New Mexico, where local store The Candy Lady has begun selling bags of blue-dyed rock candy based on the actual props it supplies to the series. Not surprisingly, a lot of people in Albuquerque can't get enough sweet, sweet meth candy: Owner Debbie Hall says she's sold over 300 bags of it since Bryan Cranston pulled some out on the Late Show With David Letterman last month. "The response has been great," Hall told The Associated Press, clearly drunk with power, and possibly scheming to kill some innocent people if it means getting what she wants.